Today's 'Blogger Style' feature takes on a slightly different form today but I know that deep down you will love it. 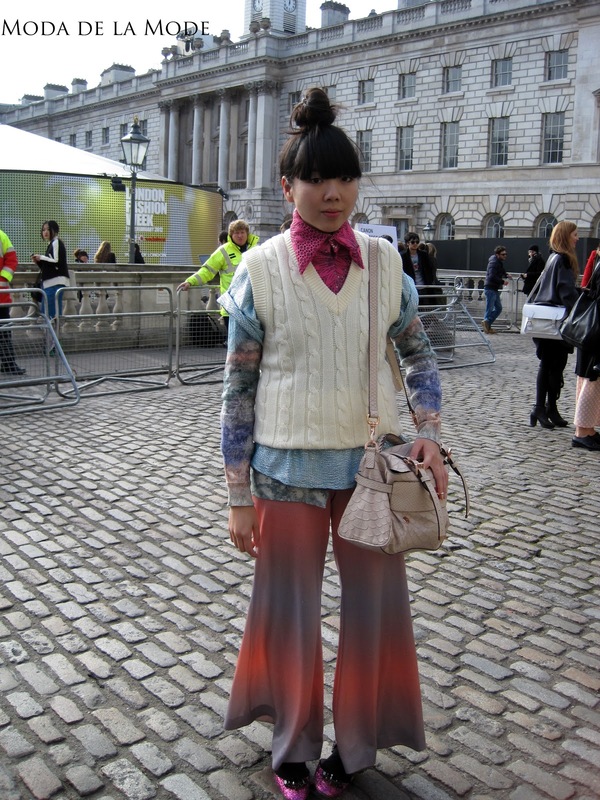 During London Fashion Week I managed to catch a moment with Britain's favourite fashion blogger, Susie Lau. Her iconic haircut and eclectic mix of clothes have brought her international acclaim and she has become not only a trendsetter but a style icon in her own right. Blogging daily on her blog, Style Bubble, Susie is at the forefront of fashion bringing the latest news, trends and must have items straight to our computer screens. I just love her sparkly hot pink shoes peeping through her striped palazzo pants (the colours of which are strikingly similar to the backdrop of her blog)-such a playful touch. Her crocodile Mulberry bag finishes off the outfit perfectly and really compliments the numerous layered shirts that are hidden under the cricket jumper.